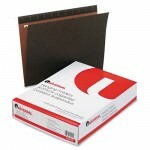 Office supplies are an important part of keeping any business running smoothly. But, the actual process of buying office products can be tedious and time consuming. Let’s be honest, purchasing office supplies is usually toward the bottom of most priority lists. 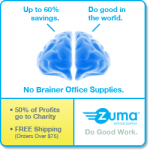 Zuma Office Supply changes that by helping you do good work not only in the office, but also in the community every time you buy office supplies. Zuma takes the mundane but necessary task of buying office supplies, and adds the component of helping others and giving back. Our company mission is to donate a minimum of 50% of profits to great charities. In addition, we ask you to tell us which charity you would like us to support when you check out, so the not so fun task of ordering office supplies actually generates money for a charity that is close to your heart. 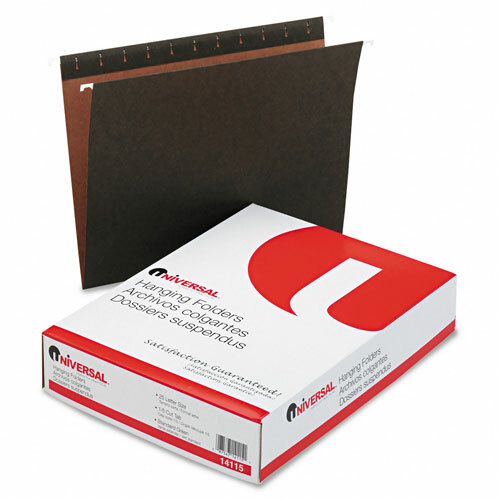 Buying every day office supplies like these hanging folders can help a charity you love. We also know with the difficult economy that businesses can’t pay more for office supplies, even when a company like Zuma is doing good work. We know low prices are of paramount importance, especially to small business. Our pricing philosophy is simple. We price check the big box office supply superstores – Staples, Office Depot and OfficeMax – and guarantee that our pricing meets or beats all of them. That way you know you’re getting a great deal, and can spend your time doing productive work versus price comparing the office superstores to see who has this weeks better deal. We are often asked how did we select the charities we support. First, we were selfish and started with charities important to us. Next, we talked with people and did research to make sure we included charities that covered a wide range of causes, so most everyone will see an organization that they care about. Then, we researched the financials and ratings of each charity on our list checking how much money goes to the cause versus fund raising and “overhead”. We reviewed things like CEO salaries, their results and track record, and in most cases selected charities that are national in scope. That’s important because Zuma ships nationwide. What resulted is a great list of wonderful organizations that do awesome work across the globe. Some are very well known to people like the Salvation Army and Big Brothers Big Sisters. Others are lesser known charities like The Fisher House, which provides housing for military families with family members in military hospitals, and the V Foundation who does incredible things in cancer research. Most of the charities are 4-star rated by Charity Navigator, and use an amazing 90%+ of their donated funds for the cause. Supporting great charities like The V Foundation adds meaning to the task of ordering office supplies. It’s been interesting gathering customer “votes” regarding charity preferences. We all know advertisers pull on people’s heart strings with pets and children. It’s no surprise then that Best Friends Animal Society and Save The Children are our two most popular charities. We also support one local charity, the Capital Area Food Bank in Austin. That’s one of the personal choices because feeding the hungry in our own backyard is important to us. On top of giving back, and guaranteed low prices, there’s one more component required to be a great supplier. That’s fast shipping and personal, caring service. At Zuma, using our national logistics network, most orders are delivered the next business day nationwide! And personal service? We know calling companies and getting in the “phone system loop” is very frustrating. When you call Zuma, you get a live person right away, and we work to make sure that person can take care of your needs – no transferring from department to department. That’s partly because we’re still a small company, but will always be at the core of how we do business. Feel Good Buying Office Supplies From Zuma - A No Brainer! At Zuma, we like to call it “No Brainer” office products. When you can get guaranteed low prices, fast free next day delivery AND help give back to charities doing good work, why buy office supplies online anywhere else? That’s why we say feel good doing business with us. Let us know your thoughts, and enjoy today! This entry was posted in Charities, Conscious Capitalism, Cool & Interesting Stuff, Zuma Info and tagged Big Brothers Big Sisters, Charity Support, conscious capitalism, office products, office supplies, Office Supplies Online, The V Foundation. Bookmark the permalink. Punctual and to the point. Glad you liked it. Hopeful that more companies will take a conscious capitalism business approach to help society! Love the way Zuma has unique office supplies to brighten up the personal space! Thank you, Connie! We appreciate your feedback and we hope you continue shopping with Zuma!